Bird bander James Junda’s seasonal summaries always contain a lot of information, including technical details that other scientists would want to know: such as, how many nets were used, where they were placed, how long the nets were open and for how many days. It’s not the most exciting information, but it’s important to include because these factors that can influence how many species of birds you band and the overall numbers. 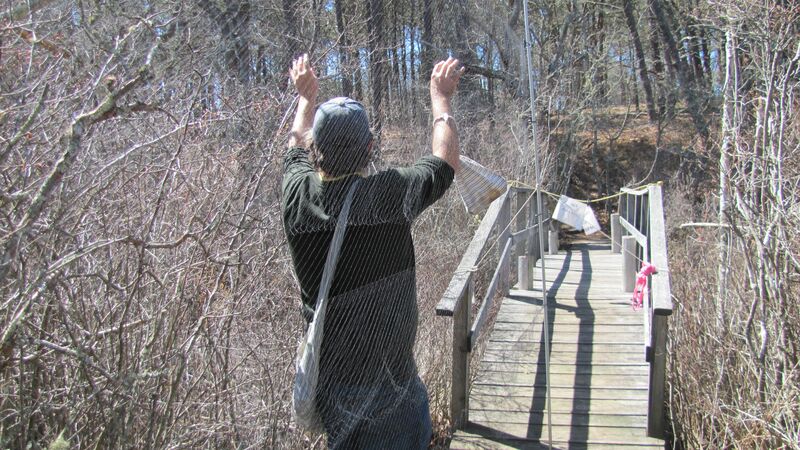 In bird banding, net placement is crucial! Nets along the Silver Spring trail were the busiest this past spring with a little over 43 captures per 100 net hours, almost 40% higher than the next busiest nets–those placed in thickets next to the Bay View Trail. Nets in the upland fields near the bird boxes were the slowest in spring, yet they’re the busiest in the fall. 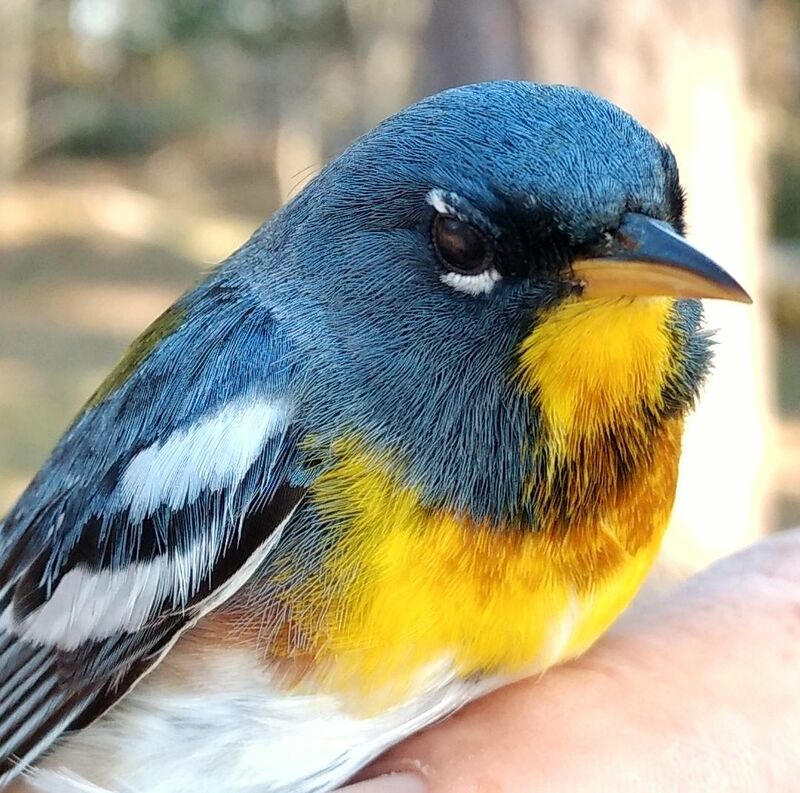 But for many of us, we just want the bottom line: What was the total number of species you banded last spring; what were the most common birds captured; and, of course, what “cool birds” did you get? Let’s start with the overall numbers from spring of 2018. The banding station captured a total of 77 species, up by one over spring of 2017, and the most species banded since spring of 2015. A total of nearly 1200 birds were caught. Gray Catbird–a total of 91. Next was Black-capped Chickadee (62); American Goldfinch (54); Golden-crowned Kinglet (51); and Magnolia Warbler (30) making up the top five species. Summer of 2017 must have been good for Golden-crowned Kinglets. We captured a total of 51. We’d had only FIVE each of the previous two springs! Before you dismiss catbirds and chickadees as so common that it’s no surprise they topped the list, consider something else the numbers show. 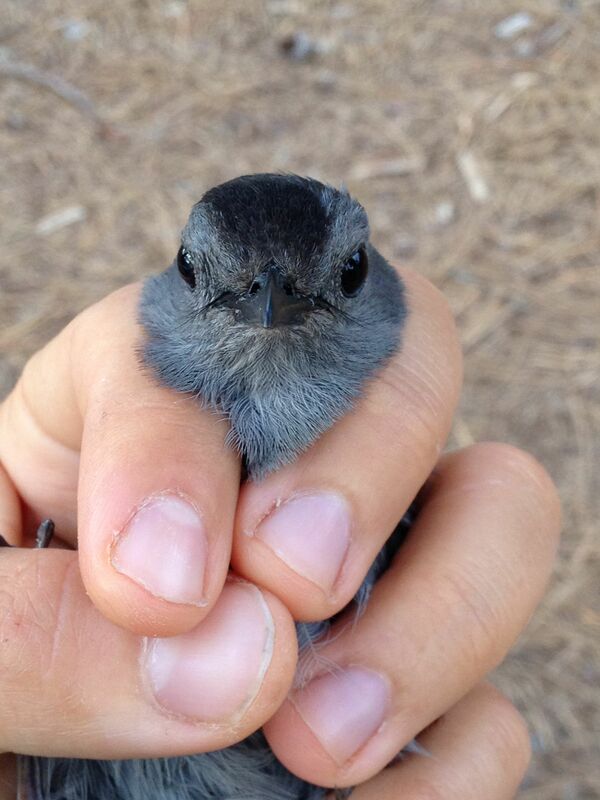 While we had 91 catbirds in the nets this spring, we had 130 last year and a whopping 271 the year before. For chickadees, 2017 saw 87 individuals and 143 the year before that. The downward trend also continued for American Goldfinches—54 were banded this spring compared to 96 last year and 105 the year before. While some of the declines may be due to the fact some species are coming off big breeding years, it’s a trend we’ll keep an eye on. But there was also good news from the nets. James reports a sizeable increase for some warbler species such as Northern Waterthrush (13 netted compared to just 2 in 2017); American Redstart, Magnolia Warbler, Blackpoll Warbler, and Northern Parula. 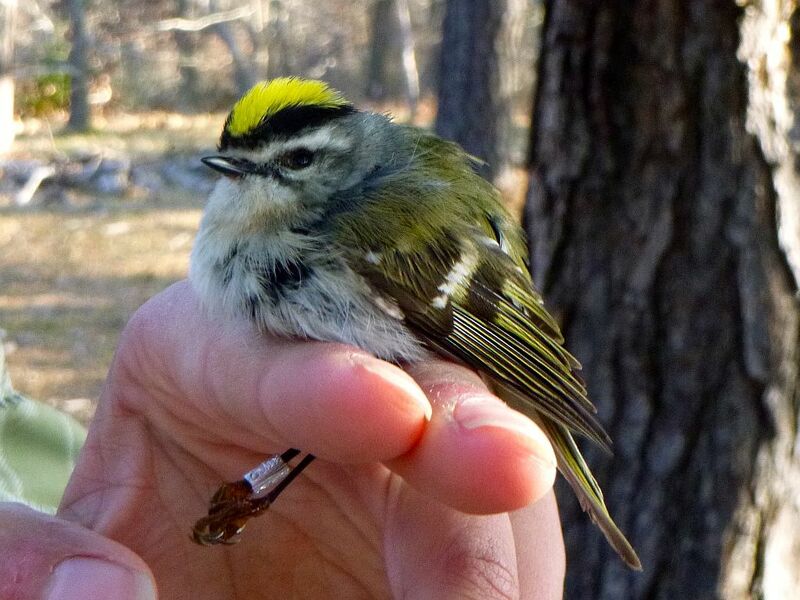 Eighteen Northern Parulas were banded this past spring. We had only 3 of these warblers the same time last year. While some of these birds did enjoy strong breeding seasons last year, James also notes that spring storms produced “fall-out” conditions when migrating birds were forced down in larger than usual numbers and some ended up in the nets. 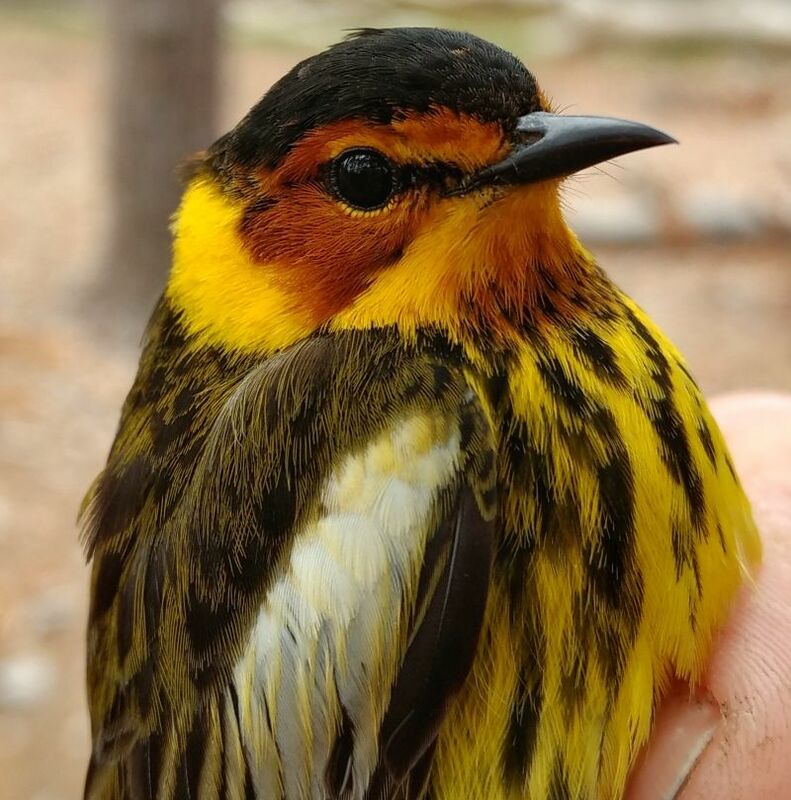 We’d never had a Cape May Warbler at our banding station until last fall when we captured 6. In spring of 2018, we had 14! These handsome birds had a great breeding season last summer. As for the cool birds? We’ll call these the one-season wonders, because each species was banded only once: Warbling Vireo, Willow Flycatcher, Blue-winged Warbler, and Blue-gray Gnatcatcher (first time for the station). There’s another question James is often asked. Have our banded birds been found by anyone else? Last May two Wellfleet-banded birds were recaptured at other banding stations. One, a Gray Catbird banded here in the fall of 2015 as a hatching-year bird, turned up across the bay at Manomet in Plymouth. A second bird—an American Goldfinch—banded last fall was recaptured in Brewster. This entry was posted in Updates on August 25, 2018 by Wellfleet Bay.